Fashion is meant to make us feel. The evidence of emotion, movement, and creativity in garments that both enhance and envelop models as they strut down the runway is crucial to every collection -- and this is an idea that Designer Andre Landeros Michel executed perfectly. From the people attending to the atmosphere to the designs themselves, the Landeros show was impeccable. Held at the Scandinavia House in Midtown, the show is intimate and dark. The runway snakes around a raised platform surrounded by iridescent lights. As the audience makes their way to the floor, loud music vibrates throughout the room, and suddenly, the lights fall. Singer Baby Yors, clad in flowing pants and a triple-belted corset swanks onto the stage, accompanied by violinist Aaron Bos. The duo puts on an electrifying performance complete with stunning projections of men modeling Landeros’ designs. After the performance, the electronic music begins to reverberate throughout the showroom once again as the lights flash on. Suddenly, the first model walks out. He is tall, black, and slender with a powerful presence. His outfit is both delicate and bold, complete with a sheer, gauzy dress, a tall cotton hat, and chunky industrial boots. The next model follows, a tall and gorgeous albino man, sporting structured, futuristic pants, and a black top. An asian model takes the spotlight, his look complete with messy, tangled hair that covers his eyes that perfectly compliments his intricately detailed and tailored suit. Female models follow shortly thereafter, and the audience is reminded of the genderless nature of Landeros’ designs. Looks in lavender and pastel green surprise the crowd, but bring a breath of freshness to the entire collection. The show finishes with a transgender model in a striking black suit, and the crowd erupts with applause. The Landeros show was dark, unique, and fascinating. Every look - both because of the model and because of the garments - captivated me. 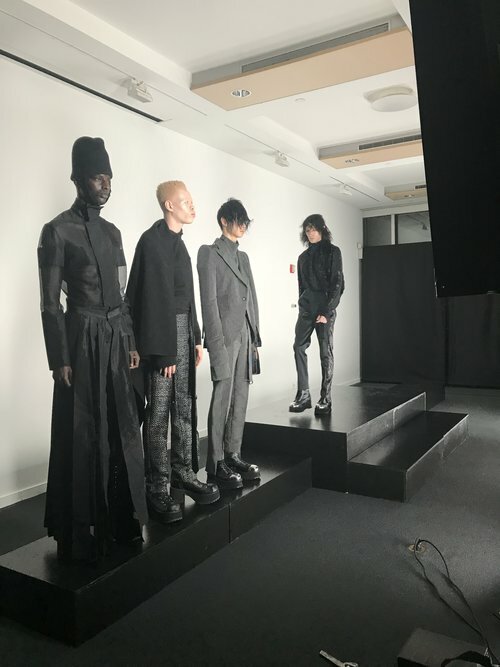 They reminded me of the power that clothing has in shaping both how we feel and how we perceive others - and for that, I applaud Andre and his entire team.